Far out, it’s everywhere. What used to be ‘party food’ is now ‘every day’ food and the rise of the Fitspo social media gurus flaunting their perfect bikini ready bodies say that you can have your cake and eat it too. Um, yeah, well no…I disagree. It’s now filtering down to the kids and everyday households are now offering their kids a ‘treat’ for just about everything. There’s a sugar laden snake after every soccer match (and it doesn’t often stop at one) and a ‘treat’ in their lunchboxes followed by an ‘after dinner’ treat. Seriously, it’s gotten a little out of hand, wouldn’t you think. Don’t get me wrong, we’re not pushing a ‘salad-only’ eating phenomenon but when did party food become the norm in the tummies of our beautiful kids? I find mums everywhere signing up to blogs or buying cookbooks written by people who claim that their ‘dessert’ is ‘healthy’. When I dig deeper I tend to find it a little strange that chocolate or cheesecake is being pushed as healthy. 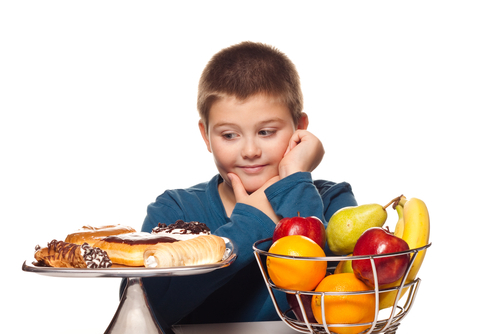 Have we become that uncontrolled that we, as adults, need a ‘treat’ every day, or every mealtime to get through the day? I’d say so, given that this trait is fast becoming a trait of our children too. Kids are getting fatter and more unfit? Schools are desperately try to shift children to a world of healthier eating with healthier canteens (some more healthy than others) and the rise of the ‘crunch and sip’ phenomenon where children are encouraged to bring fruit or veges to school for a mid-morning snack. But I can tell you from experience, something isn’t working. Kids are getting fatter and more unfit. Kids are ‘expecting’ a treat after dinner and that treat isn’t fruit in many of these households. Kids are exhausting…we love them but let’s face it, the whine of the kid that wants that chocolate can wear any health conscious parent down to the ground. Seriously, it’s like nagville. I’ve got three and combined my husband and I are outnumbered. But I’m here to be their parent, not their friend, so my kids get ‘no’ quite often when it comes to junk. Why are we giving our kids chemicals? Now, if I asked you to give your child a bottle of chemicals to drink that had some sweetener in it you would likely tell me where to go and call the police. So, why then are we not reading the labels of these ‘treats’ and getting quite alarmed with the utter crap being shoved down our throats in supermarkets. I would say that a majority of the ‘food’ in supermarkets should be a chemical plant, not a store that claims to sell food. If grocery shopping is taking you a long time, here’s my tip – you’re going down too many aisles because most of them are full of garbage. The other sad part is that the ‘health food aisle’ doesn’t get my tick of approval either. We’ve replaced healthy options with packaged, processed garbage that has been filled with ‘fillers’ of some sort to make them palatable to the kids…but and the adults! Olive oil is being replaced with high processed seed oils being more and more closely linked to cancer every day, sugar is a major ingredient in the ‘low fat’ options and chemicals that I’d rather clean a pool with are being masked behind names no one can be bothered to read so we just ignore them! Here’s the tip – if you don’t know the what the ingredient is then chances are you are you shouldn’t be eating it. End of story. The other alarming thing is that every time you give your kids one of these packaged items such as ice cream you are depriving them of the opportunity to nourish their body with something healthier. Kids are addicted and so it’s easier to give in and buy it. We feel the need to give our children ‘treats’ or we go down the list for ‘Best Parent of the Year’ nominations. We haven’t got time to read the packaging so we just buy what’s at eye level. Convenience of having packaged food in lunch boxes. We’d rather not pack an ice brick to keep the healthy food cool so we buy a packet of chips that won’t go ‘off’ in the sun. We’re not recognising the dangers because no one dropped dead on the spot from eating a packet of chips. The effects are seen much later but the damage is being done immediately. What’s the trick to wearing the kids down? Truly, if you want to know the easiest way to get your kids to not eat party food on a daily basis here it is…DON’T BUY IT! Yep, I’m not kidding you. Some of you may be thinking ‘Wow, I got to here and that’s what she had to say?’ but stay with me a little longer. It’s easy at this point to think that that recommendation is ricdiculous and that ‘we should be able to have treats’ but here’s what you may not be realising. You can retrain your kids and depriving them of that crap and having them go without is better than giving it to them. Every time you give your kids sugar, it’s fattening up their liver. Every time you give your kids chemicals their DNA is changing. It’s happening and you won’t see the signs until their health suffers down the track. Sure, while my household does keep treats I have gotten it to the point where I am happy with the balance but we have cut right back. And I say ‘no’. My youngest loves to eat. She is also very persuasive and has the stamina of a bull (hoping she will make a fabulous leader one day). But I have found that she now knows that after a ‘no’ I mean ‘no’ and she will hit the fruit or veges for a snack…and here’s the great part….she suggests it! I kid you not! Sure, the conversation used to be longer but it’s getting shorter and she is realising that there are other options. Don’t buy packaged items on a weekly shop. If your kids aren’t at parties every week or getting sport ‘treats’ then you may like to introduce a ‘treat night’. We do this in our household on Friday nights and the kids can watch a movie and have a ‘treat’. If I can make it homemade then even better! Send a snack to play dates if you’re not sure what the kids will be eating. Teach your kids the basics about food and health and go from there. Keep educating them as they go. Be informed yourself and read the labels! Better still, avoid packaged food. ← Fitness is the key to post-baby return to work! Is Sugar Really as Harmful as Cigarettes? January 1, 2016 Editor@thefitbusymum Comments Off on Is Sugar Really as Harmful as Cigarettes?